Trending at AU $6.05eBay determines this price through a machine-learned model of the product's sale prices within the last 90 days. 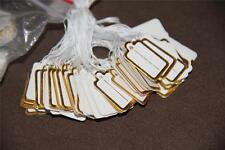 Hang sell tags / tabs as seen in photo. Both front and back of tag/tab shown in the photo. Very good quality. 100 per pack, price is per pack. We have larger quantities available please email me. Tab/tag size is 2.5 x 3.3 cm hole 8mm in diameter. The efficient way to display stock! We are closed till 9/1/19 there will be no deliveries during this time. Plain back and front, easily apply sticker. Features: 100% Brand new and high quality! Great to show 925 silver price and number. 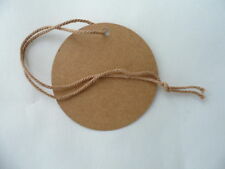 Knotted string lets you add and remove tag easily without tying knots Special rectangular shape design. White cardstock offers a smooth writing surface It is necessary store accessories. Snap Lock Pin Security Loop Plastic Tag lines Fastener Tagging Ties 5 "
You are buying 500 quality paper swing string jewellery price tags, little and cute, with imprinted 'MADE IN ITALY' on 1 side. Tag measures approximately, Length: 19mm Width: 9mm Also available on many other styles tags & labels, please visit sub-category Tag, Label and Tie under our store category Retail Packaging for details. In particular, They are stunning wedding favor that you will be proud to present to your guests. Colour: Brown. for most of our products. Material:Kraft Paper. - The item itself must not be opened. We acknowledge the external box may have been opened for a visual inspection, but nothing else must be opened or used. 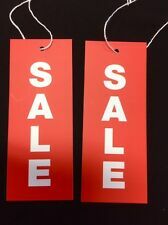 Perfect for scrapbooks,signs,card ,gift bags etc. This Rexel 4 Digit Tally Counter is a hand held counter which is great for inventory, traffic and attendance counting. General / product type : Tally counter. Desk Accessories. This is a 4 digit counter and can count up to 9999. 500 Adhesive Size Labels- Supplied on sheets. These labels are paper adhesive they are not sew on. 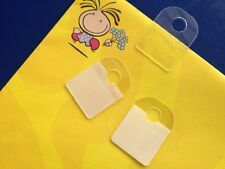 These labels are great for sizing your Plastic bags. 12, 14, 16, 18, 20. (50 stickers per sheet). Conference Supplies. Monitors & Digital Signage. Luggage & Travel. School Art. Suspension & Lateral Filing. School Bags. Ink & Toner. Copic Art Range. Conference Supplies. Monitors & Digital Signage. Luggage & Travel. School Art. School Bags. Ink & Toner. Copic Art Range. Binding & Laminating. PICKUP FREE FROM WAREHOUSE. WHAT YOU GET. 100mm L x 50mm W.
Black string attached. Width (bottom of dress across) 40mm x length (shoulder to shoulder) 84mm. 90mm H x 55mm W with string attached. Can have sticker applied. Camouflage print. With a section to add number size and price. Large: 500 x 450 x 125. Small: 350 x 260 x 95. X-Small: 265 x 160 x 50. 10 PIECES TO A UNIT. Aluminium/alloy electronic EAS RF security system. 8.2MHz RF electronic EAS RF security system. Price is for 1 Pair / 1 Box and i have 6 boxes if interested. 157 44.5 6.5cm. Conference Supplies. Monitors & Digital Signage. School Art. School Bags. Ink & Toner. Copic Art Range. These tickets are acid-free so they won't react with inks, glues and other materials. Labels (number per sheet/roll) : 500. Conference Supplies. Monitors & Digital Signage. School Art. School Bags. Ink & Toner. Copic Art Range. These tickets are acid-free so they won't react with inks, glues and other materials. Product width (mm) : 22 mm.